Address：11, Jalan Kota Laksamana 1/2, Taman Kota Laksamana. This is what I need right now, with the heat outside! I am taking down this address into my little diary of goodies. durian and mango is a good combination. one more in my melaka’s to-eat list!! I have not try this yet, maybe will do it on my next trip to melaka. Wah! Good choice for a sunny day. This would definitely be heaven sent on a hot sweltering day… you walk in from all those sight seeing in the sun then …… a lovely big bowl of this awaits you…. heaven!!! 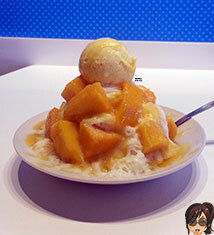 i love desserts of any kind, this would be nice to eat on a hot day. wow! they have new dessert choices ya 🙂 so good! It’s a good place to stop by after a hot walk at Jonker street! I love ice cold desserts. This is one I must try!